SO folks, it’s exactly 31 weeks and 6 days of the bun cookin’ in the oven! Which means 8 weeks and 1 day left…EEKKKK!!!!! 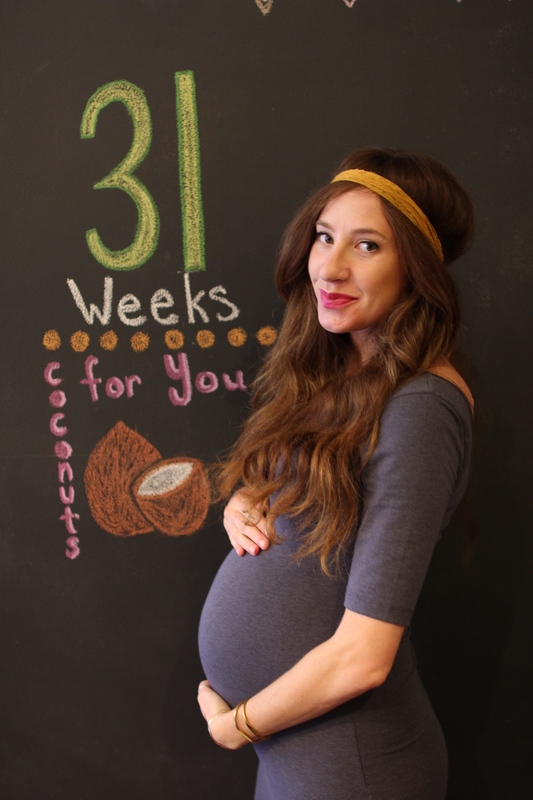 Baby is the size of a coconut and I am completely COCONUTS for him:) I’ve been in the third trimester for a bit now, I have had two baby showers, and one more this weekend, and let me tell you it has certainly been a ride! All these baby showers are the product of having loving family and friends all over the map, and we feel so blessed to be celebrated so many times!! So for the good: I am OVER THE MOON excited and every time he moves I just get all giddy. I read a book or two to him every night and talk to him all of the time:) He has already flown on a few plane rides; Belize, Mexico, Erie, and Philadelphia, so far so good. His room is almost completed and we have officially trained his older brother, Alfie the dog, to not be deathly afraid of his stroller. He has a BIG appetite and craves different foods at all different times, making his Momma a bit food crazed. He especially loves fruit and lentils….I know lentils right?! He has a friend that lives down the street due a few days after him, and has another friend due in the Fall! Not to mention his very own cousin is on the way- we find out soon if it’s a boy or a girl! For the not so good: Momma has developed a baaadddd case of Carpel Tunnel in her right hand, where her fingers are completely numb, and her wrist and hand have blown up like an octopus:( This keeps her up pretty much all night from the pain and she has been going a bit crazy. However, she came across a women named Sara Morrissey, who works at Balans spa in Boston and specializes in all sorts of interesting massages. She is also a chiropractor. We are hoping going twice a week helps out, and will keep everyone posted! I am also super hot ALL OF THE TIME, and blast the hubby out of the bedroom at night with air conditioning and a fan…sorry!!!! So I also have that baby brain issue people sometimes get when pregnant and maybe forever like Mom brain…eek, where your mind kinda stops working and you are all fuzzy, so yea, that has been interesting and pretty funny at times. Also, this dress that used to be a bit loose, is now a bit too tight, hope it lasts for a few more chalkboard updates! I have a love of cooking, music, and creating beautiful things. Thanks for checking out my site!!! Follow the Speck of Yellow! Find What Your Looking For….